Not your typical clay dug out of the ground. 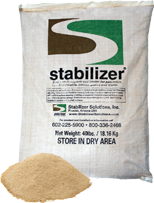 A manufactured blend of clay and interlocking soil particles stabilized against moisture, all at a great price. No longer will your mound turn to mud. This stabilized mound clay is designed to manage moisture for you, it remains stable during rain events and holds onto water longer in dry periods. Stabilizer Ballyard Clay is ready to pack out of the bag, so you don’t have to sacrifice player performance for time and budget.